A Flurry of Special Guests! ~ The Toronto Hare Krishna Temple! A Flurry of Special Guests! With spring upon us, many special guests are making their way to Toronto to enliven and inspire everyone with seminars and more! Making one of their many trips to Toronto's Hare Krishna Centre are none other than His Grace Vaisesika Prabhu and Her Grace Nirakula mataji! They are truly members of our large community and we are very excited to have them once again to encourage our many sankirtan initiatives. 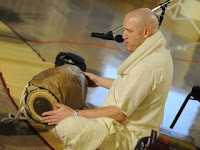 Sankirtan refers to the process of sharing our spiritual culture through book distribution. The schedule is jam-packed with different events that will surely entice everyone! Sunday, May 19th: Sunday Feast! Please don't miss out on an amazing week!